Wanda Lavinghouse Russell of Palm Coast, Florida was a former religious, married. Wanda is a retired Social Worker who has a Master’s in Education, Counseling. 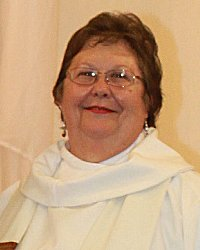 She has been an active volunteer in RCC ministry most of her life as Eucharistic minister, lector, prayer group leader, RCIA team leader, charismatic healing ministry and prayer team leader. Wanda works ecumenically to bring people of many faiths and backgrounds together. She co-leads a theology reflection group. She is co-pastor of Inclusive Catholic Ministries which has been established to serve the northeast area of Florida. Wanda was ordained a priest April 14, 2012.